Do you want a list of the top 10 stocks that were recently upgraded? Find banks with a liquidity ratio under 10%? Or identify mutual funds with total assets between $5B and $20B that had a minimum 10% return over the last three months? You can do all of that and much, much more—drilling down as deep and as narrow as you like—with our Screener. PLUS, you can save the Screeners you create so you can refer back to them over and over, with the Ratings and data automatically updated for you. Since the Screener is so versatile—and since each Ratings industry has its own unique Screener--we’re going to dedicate several tutorials (and some tips & tricks articles) to showing you how to get the most out of this amazing tool. In this tutorial, we’re going to give you an overview of the Screener and how to put it to work for you right now. When you click the red Add Criteria button, what you’ve selected gets added, and you’ll see the matching results below. As you can see in our example, the five criteria we added returned a list of 16 stocks. Say you’re not satisfied with the results you get after adding your criteria. Well, you can do something about it. Just like Rating, many of the criteria have sliders and value boxes you can adjust, should you want to refine that criteria further, after you’ve added it. If you’re happy with the results your Screener has generated for you, and you’d like to save it to refer back to over and over, you can do that. All you need to do to is click where it says “My Screen” at the top of the page. The text will turn blue, and you can type whatever you want to name this Screener into the box. Clicking the Save button saves your Screener and you can access it anytime you like. 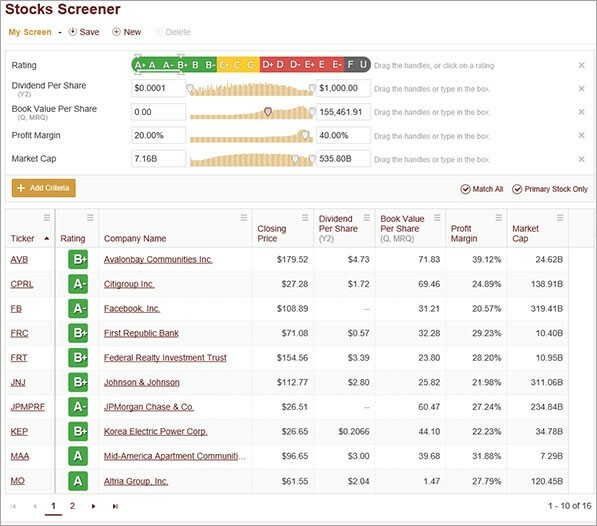 To access your Screeners, click the words “Stocks Screener” in the upper left, and you’ll be taken to a page that lists all your saved Screeners. 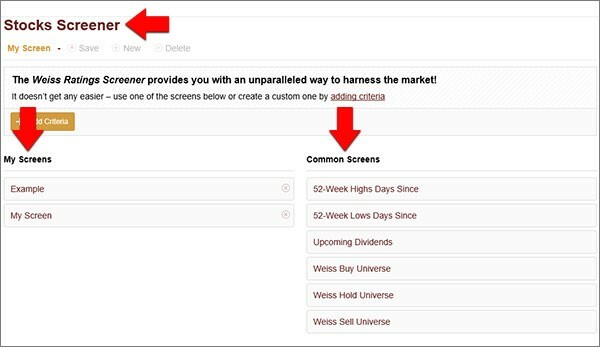 You’ll also see a list of Common Screens we’ve created that you can customize. And that’s how you can use and save Screeners to deliver data the exact way you need it.